Manchester United are reportedly chasing the transfer of Tottenham striker Harry Kane as they face losing two big names up front. A report from Spanish outlet Don Balon claims Kane is a big target for the Red Devils ahead of the summer, with the England international keen to finally leave Spurs. It is likely Tottenham would demand at least £200million for their star player, who has established himself as an elite goal-scorer in the last few years. Don Balon claim Kane is being eyed as Romelu Lukaku looks set to leave, with his agent Mino Raiola offering him to top clubs around Europe after his struggles at Old Trafford this season. The 25-year-old Tottenham hit-man would undoubtedly be an upgrade up front, though one worry for United is Marcus Rashford’s future as well. Harry Kane to Manchester United transfer, plus Romelu Lukaku and Marcus Rashford to leave? Kane transfer to replace Lukaku and Rashford at Man Utd? The Telegraph note that MUFC are working to tie Rashford down to a new contract as Real Madrid show an interest in him ahead of the summer. The 21-year-old is yet to commit his future, and that has also reportedly got Barcelona on alert, according to Don Balon. While it would be a blow to lose Rashford and Lukaku in one go, Kane is good enough that he’d be a strong replacement for both players up front. And selling the pair may be the only realistic way MUFC could afford to fork out as much as £200m for Kane. 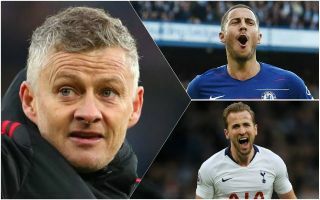 That money could in theory also go to long-term target Eden Hazard, though he seems more likely to be on his way to Real Madrid this summer as well, though perhaps that could change if Rashford is signed by the Spanish giants as an alternative.